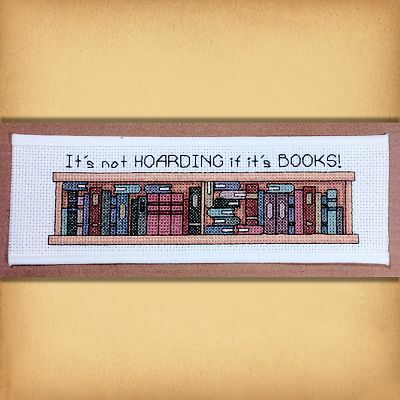 - A simple truth that is self-evident to all book lovers: "It's not HOARDING if it's BOOKS!" When finished, you can frame the completed piece for your wall, or better yet, use it as a bookmark. 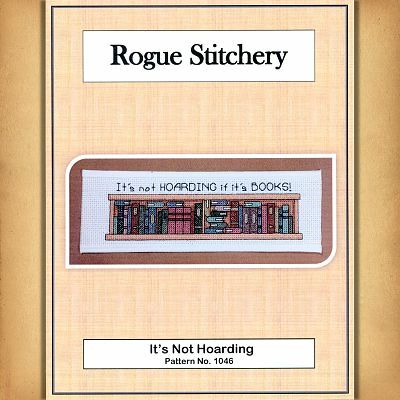 This is a great project for intermediate stitchers. The design is relatively small— only 103 stitches wide by 30 stitches high, and the entire printed pattern fits on a single page. 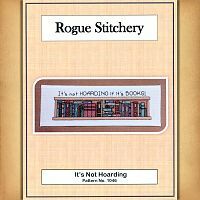 But you do get lots of practice with backstitching, both in the lettering, and also around the edges of the books. The pattern also include quarter- and half-stitches. Instructions are included. This is a pattern for counted cross stitch. It is not a complete kit. You will need to supply your own fabric and floss. The finished size of the piece will depend on the stitch count of the fabric you choose. The designer recommends using 14-count white Aida cloth for this project, giving you a finished area of 7 1/2" wide by 2 1/8" tall. Remember to allow extra fabric on all sides so you can trim it down to size when you finish. Do you have any other questions about our "It's Not Hoarding…" Cross Stitch Pattern?